The month to month comparison for Food (retail and restaurant) doubled its decline in the fourth quarter down 152 basis points Vs the 75 bpts decline in the third quarter. The initial headlines have been the same this quarter as the third quarter... close to panic. But again you have to say that it has been a roller coaster of a year with input and transportation costs cycling high in the first six months then sharply declining in the balance of the year. And these costs have declined, the ability of food businesses to pass along these savings has increased. Now, there are some big tectonic changes underway. Declines in premium foods, expensive restaurants, increases in couponing and private label. But the biggest news to me is that on a full year basis, there was only a 2% decline Vs 2007. Way back in college, I spent a lot of time analyzing the cold war, deterrence theory and MAD - Mutually Assured Destruction. The net result being that the interest in status quo between two competing interests outweighed the desire to go to war with them. CPG brands and their retailers have their own version of MAD, played out in the promotions and profits each exacts upon the other. Today the WSJ wrote about the Safeway earnings call where the Safeway CEO called for CPG manufacturers to reduce their pricing to retailers so they can reduce their costs to consumers. If CPG manufacturers do not comply Safeway use its own private label offerings to target branded products. While all this sounds quite logical, the experience of the CPG manufacturer is that there is a rarely a direct line between a drop in wholesale pricing and retail pricing. Once the new margin structure is established it is far easier to manage a lower price through Temporary Price Reduction promotions (that can also get end cap displays and in-ad features) rather than hope the retailer does not soak the manufacturer for additional margin. Thus the standoff is created, and the retailer has its private label as a weapon of last resort. So, what is the MAD situation? Retailers and manufacturers increasing margins to offset lower volumes, resulting in higher food prices and accelerated inflation. And the winner? Walmart - which has a simple value strategy that has not changed in the down market. Apparently researchers have identified that caffeine can help kill skin cancer cells. Seems like its pretty flimsy right now based on mouse and empirical tests, but you never know - we may all be bathing in Monster or Red Bull at some point! A Pound To Take Leak? I really enjoy finding value offerings that use value as a brand as opposed to a simple pricing strategy. In airlines, this is led by Ryan Air. Ryan Air have an interesting model that uses passengers to get airport slots, while making their profits off air freight. 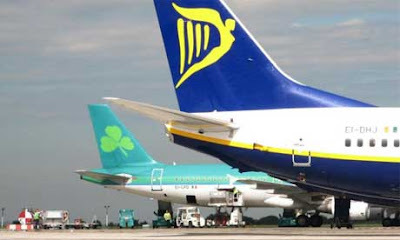 Hence you will often see airfares at Ryanair.com for a few Euros. While Ryan Air has the reputation for surly service and terrible on time records, consumers are fine with it because the costs are so cheap. This model has come under pressure as other low cost carriers have used the same idea (Jet2, Easyjet etc). So Ryan Air has introduced the ultimate a la carte approach to travel... extra charges for checking bags, checking in at the airport etc etc. This has reached a new extreme with Ryan Air considering a $1.40 charge for using the toilet on a flight. The fundamental value strategy of Ryan Air is strong, but there is only so far that you can push the consumer. Most of their charges are something you manage and opt into. But charging for toilet use on a flight is extortion, and different to every other a la carte charge. It takes a big marketer to listen to its consumers and admit a mistake. So Tropicana is to be applauded for returning to its iconic "straw in orange" design. But underneath this is the growing power if social media, and the need for businesses to stay close to their consumer base. This move will have the effect of making Trop's consumers feel even closer to their brand But - oh the upheaval to the business... two repackages in 4 months, lots of sleepless nights in Chicago. Recession Hits Foods Too... But How Much? This article in the Wall Street Journal panics about the declines in spending on Foods. The headline is that third quarter consumer spending on food declines at -3.7% "The steepest decline in the 62 years" that records have been kept. At face value, really terrible news... "Markets and Restaurants Feel the Pinch as People Purchase Generic Brands and Stay Home" is the subhead. But let's think about the macro environment. The second quarter of 08 saw the price of food was the highest it has ever been: By the 3rd quarter, that had changed. In the late second and through the third quarter, food suppliers started to see a significant fall in their costs (packaging, ingredients, transportation etc). Suppliers and retailers then began to pass along the savings in price promotions. 2008 was a wacky year... and the data from it will require intense analysis to provide real insight and explanation. Two months after introduction the NY State Obesity tax proposal has died. No doubt emboldened by the success of cigarette taxes reducing demand for tobacco, NY state thought something similar for sugared soft drinks may work too. Nice idea in principle, but a combination of consumer outrage (75% negative sentiment), perceptions of fairness, and challenges of executing the scheme brought it down. There is no doubt that some government-led social engineering in the anti-obesity battle is needed, but this tax solely on sugared soft drinks was poorly thought through and the plan got what it deserved. The disclosure of the Arnell Group's Breathtaking design strategy for Pepsi was leaked to the web yesterday to a flurry of comments from "they must be smoking something" to "is that all you get for $1M?" If you have ever designed a logo for a brand, you will know that you feel the pressure of your colleagues and the consumers that use the brand - they have a high expectations: They all want to be surprised and delighted. Then there is also the pressure of the creative people engaged with the process who want to leave their own mark on a project... and finally your own thoughts and feelings that hopefully are a vision for the brand. You ask for input from all these sources, and then hope to build consensus behind the direction you want to take. The deck rationally steps the business through a process that takes the design from "convention" towards "innovation", and roots those steps in both the history of iconic Pepsi designs, and the universal lessons of design. It effectively takes debate out of the process, and presents the new brand design as a predetermined event. Tough to argue with, impossible to debate. It is a high-minded concept, well argued. But whether all of this is necessary to update the logotype and globe... well, I will leave that up to you to decide. USA Today has acknowledged the growth of protein as a sought after nutrient in this article today. 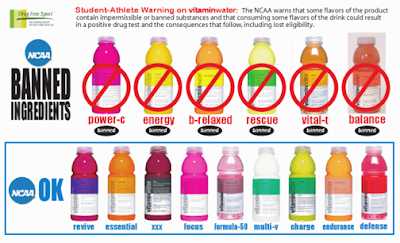 Vitamin Water's NCAA Ruling - Blessing or Curse? Vitamin Water has been brilliantly positioned. Water in the name to imply hydration; Vitamins for easy to accept functionality; and implied energy in the flavor names. This success has impacted brands like Gatorade (see posts below), and has opened the door for other functional products to come forward. But Iits been an odd time for Glaceau. First the Center for Science in the public interest claims Vitamin Water is "not healthy", then the NCAA makes a ruling that 8 of VW's flavors are too functional, and may push student athletes to break the NCAA's impermissable substances code. Proposed locker room poster from National Center for Drug Free Sport. From Ad Age - The Rescue and Energy flavors are both banned because they contain caffeine or guarana-seed extract, according to the NCAA website. The other four beverages, B-relaxed, Vital-T, Balance and Power-C, include impermissible substances such as Taurine, L-theanine, green-tea extract and glucosamine. Other impermissible substances include various amino acids, protein powders and ginseng. An impermissible substance is not able to be provided by coaches or trainers to students, but players are able to purchase products with impermissible substances. So, does this hurt the brand? Well at face value, this is undoubtly negative coverage. But I think this may help in the recent challenge the brand has faced. Consumers are doubting that the products are truly functional. "Is it just adult Kool Aid?" I am often asked. If the real issue with Vitamin Water is that consumers do not believe in the ingredients/benefits the products offer, independent verification that the ingredients are present and must have an impact. This story is likely to be noticed by those target consumers who want that extra function from their drinks. Very quietly, KO is removing the word "Classic" from cans of Coke Classic, finally ending the New Coke saga. If you don't know the full story, the Wikipedia entry is a good start. My memories of New Coke are still pretty fresh. 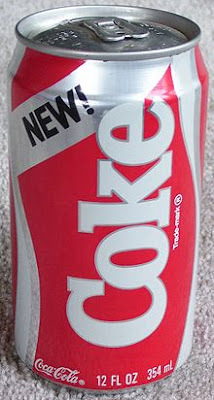 I was an foreign student at college in the US in 1985 when New Coke replaced the existing Coca Cola. My memory is that New Coke tasted very similar to Pepsi, but with less burn - and more sweet. But to many of my friends this was a betrayal. They worried that they would never find their favorite Coke again. Immediately there was hoarding, there was a black market, there was even a protest! And when Coke Classic was launched 77 days later, there were high fives and celebrations. On reflection this was all a storm in a teacup (or bubble glass?). RIP New Coke, and Coke Classic. Its been a long strange trip.